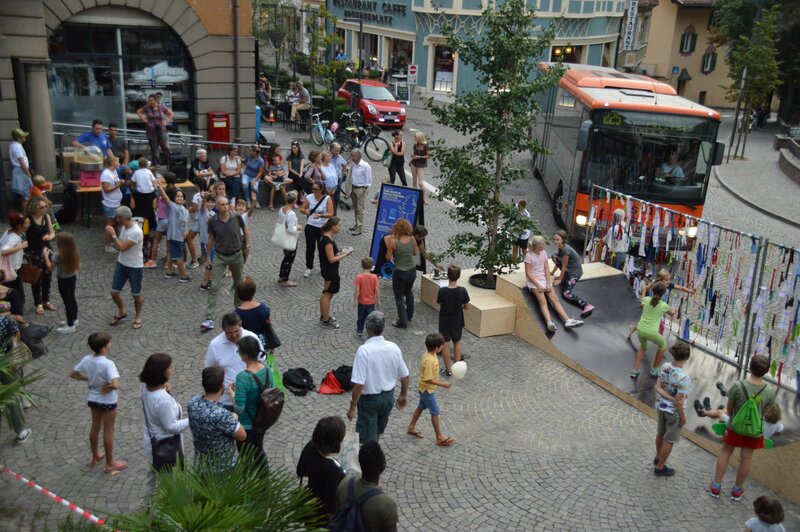 Within the framework of the Horizon2020 METAMORPHOSIS project, the municipality of Merano/Meran decided to engage children and local inhabitants in several participatory workshops to co-create possible solutions for more people-oriented public space. Children are considered as key actor to build sustainable cities and for this reason are directly involved in each phase of the project. In September 2018 the main square of the Obermais/Maia Alta neighbourhood – illegally used by local residents as a parking area – was transformed into a playing area for youngers through the construction of a skate ramp. This is the result of a co-creation process carried on in the previous 6-months by the municipality through several vision building workshops, where children, parents and local inhabitants dreamt about more diverse use of public space. Even if the skate ramp is just a temporary installation to prevent people from using the main square as (illegal) car parking, the aim of METAMORPHOSIS is to raise awareness on the potential of public space for more cohesive and people-oriented neighborhoods. Located in the bilingual northern Italian province of South Tyrol (Südtirol/Alto Adige), Merano/Meran is known as the “garden city” in the heart of the Alps. It has a centuries-old tradition as a health resort, thanks to its favourable position and climate. But despite its beauty and stunning surroundings, Merano/Meran is facing serious environmental challenges. Some of them, such as air pollution and noise exposure, are mainly related to urban traffic. While the local government is very much committed to discouraging individual car traffic and improving public transportation and cycling infrastructure, the traffic reduction policy encounters several obstacles. Objective issues play a central role, as for instance the medieval town layout based on narrow streets, but there are mental barriers among the inhabitants as well. Thus, the local government is seeking new ways of breaking the car-dependent mobility routine and managing public space. The Horizon2020 METAMORPHOSIS project (www.metamorphosis-project.eu), in which Merano participates together with six more cities in Europe, aims to improve quality of life in urban areas by encouraging the “re-appropriation” of public space by pedestrians and especially by children, who are considered the agents of transformation and are directly involved in each phase of the project. The local METAMORPHOSIS team is working together with stakeholders in different Merano neighbourhoods in order to identify specific actions which can help meet the project goal. Through several vision building workshops, children and residents are encouraged to develop ideas and to express wishes related to traffic problems, open-air recreation, neighbourhood life etc. This bottom-up approach is leading to a considerable variety of issues. While in one neighbourhood people are struggling against parking offenders who occupy the central square on a regular basis causing danger and disturbance to pedestrians, elsewhere residents are rather interested in urban gardening or in improving social life in the district with special regard to ethnic integration. In the Obermais / Maia Alta neighbourhood, the vision building workshop resulted in the idea to build a wooden skate ramp that now occupies the central square of the district, discouraging car holders from stopping in the no-parking zone. Far from being the final solution of the parking violation problem, the ramp is to be seen as an attempt of “repeopling” a public space intended for pedestrians. This temporary installation represents the realisation of a long-awaited wish of the neighbourhood’s youngsters; until then, Obermais / Maia Alta was lacking a skating facility. In cooperation with the nearby located youth centre, the wooden ramp was built in a 4-day open air workshop and set on the square. Since then, it became a meeting point for kids and families. Toddlers use it for climbing, for older children it serves as a slide, and youngsters enjoy skating on it. Still, parking offenders do not avoid the spot. The violations diminished, but the problem persists. Has the local METAMORPHOSIS team’s intervention in Obermais / Maia Alta failed? On one hand, it may seem that the skate ramp experiment didn’t meet the expectations. On the other hand, though, the team’s main concern was to “activate” the square and to encourage residents to re-gain possession of a central area of their neighbourhood. The METAMORPHOSIS project is not about final solutions. The experimental nature of the project is aimed at pointing out new ways of managing public space and arising awareness about its potential among residents and city planners. As a result of the intervention, people are now more aware of their needs and of ways of accomplishing them. Also, there is a very concrete consequence of the intervention that will very much please youngsters in Obermais / Maia Alta: given the success of the skate ramp experiment, the neighbourhood council decided to buy a skating facility and to place it permanently in a schoolyard next to the central square. As for the parking violation problem, stakeholders and METAMORPHOSIS are currently looking for complementary measures that could help inhibit car traffic on the square. The METAMORPHOSIS project has received funding from the European Union’s Horizon 2020 research and innovation programme and operates in seven European cities (Southampton, Tilburg, Munich, Zurich, Graz, Meran, Alba Iulia). By adopting the same participatory approach towards children, residents and the local communities as a whole, many other urban transformations have been happening so far. To know more about the activities of the METAMORPHOSIS project, please visit the project website http://www.metamorphosis-project.eu/. The project further produced a catalogue of potential measures to support municipalities aiming at encouraging participatory neighbourhood transformation. Join the @EuMetamorphosis project on Facebook, Twitter, Instagram and LinkedIn Group to keep updated on upcoming project results.